Two early goals for Sockers FC U-16/17 laid the foundation for a 2-1 win against Atlanta United U-16/17, who couldn't find a way past goalkeeper Stefano Mancini. A straight red card to defender Corey Hart for dragging down Sockers midfielder Christian Gambla when he was the last man back with a quarter of the game remaining didn't help Atlanta's chances as they tried to find an equalizer, and would have, except for the outstanding goalkeeping of Mancini. Sockers struck just under 10 minutes into the match from the penalty spot when forward Marek Gonda was taken down in the box and Kacper Chrapczynski converted with a well-taken kick over the diving Vincente Reyes. Atlanta responded well after conceding with a pair of quality chances created and corners won, but Mancini was on hand to thwart their attacks. Sockers then added a second via Gambla in the 19th minute. A three-pass sequence after winning the ball in midfield resulted in the midfielder slotting home from the top of the box into the lower right corner after his late run saw him get open in the middle of the offensive third. Once again Atlanta nearly responded in the following minutes but saw a pair of good chances blasted wide of the goal. The Georgia side finally hit pay dirt in the 25th minute as Wasswa Robbins picked out Brandon Clagette after a weaving run through the right side of the box and squaring to the center of the area for Clagette to tap in to the lower right corner. From there, Atlanta dominating the last 20 minutes of the half, and a big save by Mancini to deny the equalizer at beginning of second half foretold the game's remaining 40 minutes. Not to be outdone by his counterpart, Atlanta net-minder Reyes made a handful of crucial plays to keep his side in the hunt, in particular a brave stop on Gambla, who had a chance to extend Sockers' 2-1 lead in 68th minute on a great pass that bisected the Atlanta defense, but Reyes charged out to close down the angle and make the stop. The red card to Hart for bringing down Gonda, who wriggled past three defenders before being dragged down, heightened Atlanta's task -- but to their credit, the Georgia men continued pushing forward for a result and only a great save at the left post by Mancini in 87th minute preserved the 2-1 Sockers FC win. FC Dallas struck for three goals in slightly more than a six-minute span in the first half to register a 3-0 victory over D.C. United. Michael Sosa and David Rodriguez each scored a goal and set up another as Dallas remained unbeaten this season at 11-0-0. FCD has outscored its opposition this season, 44-3. The Texas side connected in the 29th minute when overlapping right back Cristian Escribano brought the ball down the right side before finding Sosa. The striker fired the ball home inside the far left post past goalkeeper Teddy Hutman for a 1-0 lead. It was Sosa's first game back after missing six months with a broken growth plate. 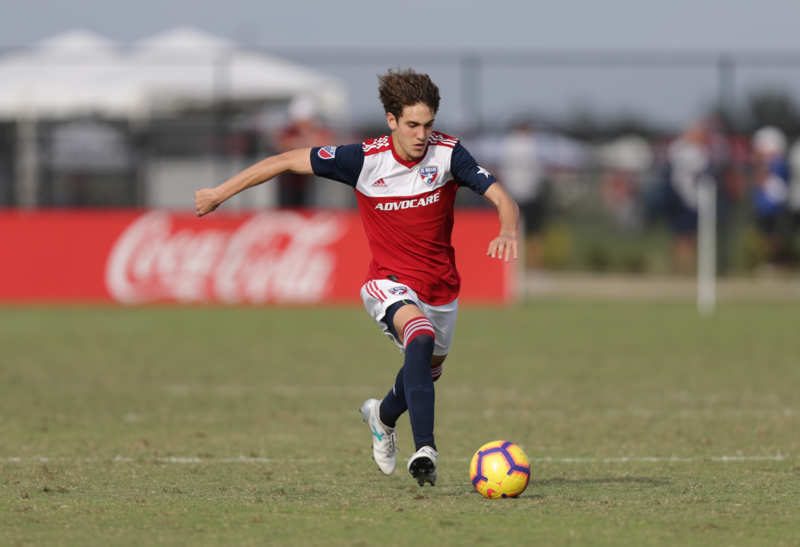 Rodriguez, a midfielder, made his presence felt from the right flank in the 33rd minute as he fed Diego Letayf, whose spectacular volley from the top of the box lifted FC Dallas to a 2-0 advantage. Two minutes later, Sosa and Rodriguez combined for a third goal as FC Dallas punished a D.C. mistake. Sosa intercepted a back pass and fed Rodriguez, who had an easy tap-in. Rodriguez has nine goals in 11 matches this term. Goalkeeper Seth Wilson notched yet another shutout, FC Dallas' eighth of the season, as he was rarely tested by United.